customer experience – Super Library Marketing: All kinds of marketing ideas for all kinds of libraries. Library social media teams may have returned to work to find a new feature on Facebook: an icon that identifies their page as responsive to comments. Facebook launched the “responsiveness” rating a few days ago and it’s important for libraries to take note of it and work to make their pages as responsive as possible. Why? Because customer interaction is essential to library marketing. * You respond to 90 percent of messages from customers. * You keep a median response time of 5 minutes for each message. When your page earns the icon, it’s visible to everyone, even visitors. It’s not as hard to earn as it sounds. Our library system is big, serving nearly 600,000 cardholders and we post 3-4 times a day on Facebook. We have one full-time staff member dedicated to social media but his job also includes video production and other marketing tasks, and he occasionally takes vacation so I do his job while he’s away. And I can tell you from personal experience that the number of messages we receive and respond to in a day is not excessive–maybe 4-5 messages on a really busy day. I might check our Facebook page once on weekends–and yet we earned the icon. So it’s doable, even for small libraries. And moreover, I think your library should strive to earn the responsiveness icon because it shows you care about your customers, working to give them the best customer experience possible. 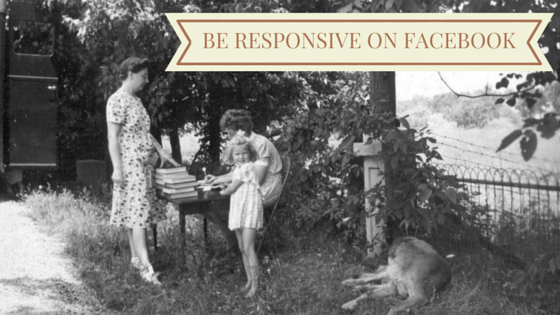 Message responsiveness on Facebook only takes a few minutes of your time each day. Your page is like a customer service desk and it may be the first interaction many cardholders have with a library staff member. There’s also a niggling thought in the back of my mind that somehow the Facebook algorithm will give more weight to responsive pages. I haven’t found evidence of that yet, but I’m pretty sure there’s a reason they’re making these badges a part of their design. So that’s a great reason to work on responsiveness! If you haven’t yet earned the icon, your page administrators will still see the icon below the page’s cover photo. The results of your responsiveness rating will help you gauge how close you are to earning the badge. If your page does not allow people to contact it, you will not get a responsiveness icon. But really, every library page should allow customers and visitors to send messages. There’s no good reason to limit your interactions with customers. Wouldn’t it be great if every library earned the responsiveness icon? I did a quick check of some of the major corporate brands and I couldn’t find any of them with the icon. This is an area where we can–and should–beat our for-profit competitors! Does your library work respond to comments and messages on Facebook? Share tips for other libraries in the comments section and, if you’ve got the responsiveness icon on your library page, let us know!